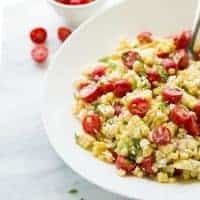 Summer corn salad with tomatoes and feta. So simple, but completely addicting. A naturally gluten-free side and great way to enjoy fresh corn and tomatoes! Bring a large pot of water to a boil. Peel the corn and cook for 3 minutes in the boiling water. Rinse with cool water then pat dry. Slice the corn off the cob into a bowl. Add the remaining ingredients and toss to combine. Refrigerate until ready to serve. The salad can be prepared up to 4 hours before serving. Enjoy!